Bring 2 quarts of broth or water to a boil in a 4 or 6 quart kettle. Add 1 quart of cooked and chopped very fine or ground cooked meat. In another bowl mix 3 cups whole wheat flour, 1 cup buckwheat flour and 1 cup course ground corn meal. Slowly and 1 quart of water or broth to make a mush. Slowly add this mixture to the boiling broth and meat mixture. Pour into 3 bread pans to mold. When cold slice into 1/4 to 1/2 inch slices. and fry in hot fat till crispy and crunchy on both sides. 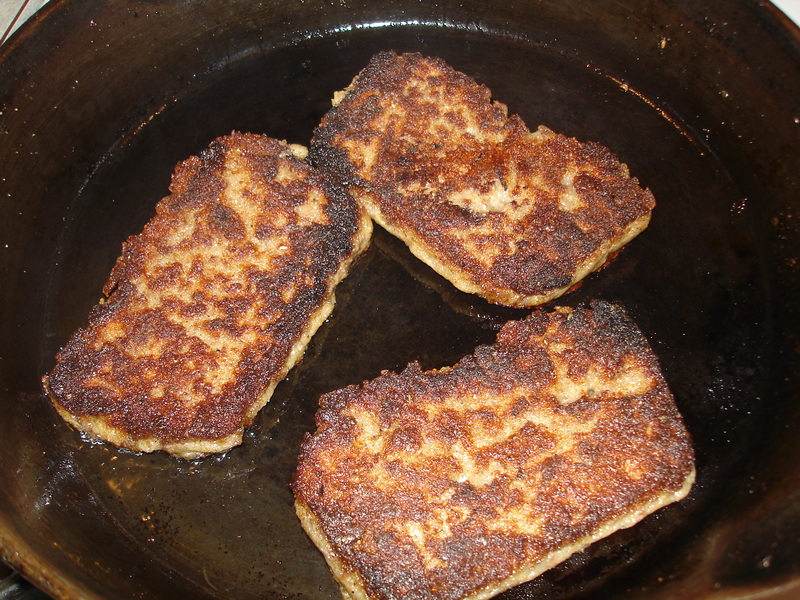 An iron skillet can fry the scrapple to a crisp – that’s the way we like it! Eat with fried eggs, morel mushrooms, and toast! It is also good with lots of molasses or pancake syrup drizzled over the top! I have used all kinds of meat in this scrapple recipe – rabbit, squirrel, venison, beef, pork, chicken,and turkey! I think my favorite is using ground ham ends! This rabbit scrapple recipe can also be made gluten-free by omitting the wheat flour and using 4 cups of buckwheat flour with the 1 cup of cornmeal. Follow the directions as with the regular recipe. This gluten free scrapple actually hangs together better than the scrapple made with the wheat.